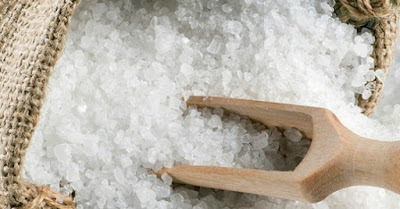 Epsom Salts, The True Benefits. I hope you're all safe considering the flooding!! So recently in my blogger mail I received a rather heavy bag of Epsom salts. I've used bath salts before and have obviously heard of Epsom salts here there and everywhere. They do originate from my home county of Surrey. I was looking forward to giving these a try but more importantly I wanted to know what it's all about. So considering these salty bad boys will cut my bath time down to 20 minutes max I wanted to find out what the benefits were. Obviously we all know of the benefits as a muscle relaxant but I wanted to find other uses. They make a great exfoliator, by rubbing gently directly on the legs you can remove dead skin cells and reduce the appearance of cellulite due to the magnesium. I also found out that it can be a hangover cure, which to me sounds amazing. Basically when you are hungover a toxic reaction of the alcohol breaking down occurs which can lead to dehydration luckily Epsom salts draw out the toxins and help tired muscles! It can improve the look of legs by using a cold compress, soak a flannel in a mix of cold water and Epsom salts and apply it to the legs to reduce the look of bruises! And according to the likes of Victoria Beckham and Gwyneth Paltrow they can also help create a flat tummy by bathing in a tub with 2 cups of Epsom salt it can draw out impurities and toxins, reduce puffiness (due to water retention) and can help your tummy look flatter.